We asked America's best chefs a personal question: What do you love to cook for the people that you love? And they answered in America The Great Cookbook -- the ultimate celebration of the most delicious food to be discovered in the country today, in all its glorious diversity, from our top chefs, artisan producers, and fascinating food heroes. This one-of-a-kind, freshly photographed recipe collection presents portraits of America's foremost food personalities and their intimate stories about food, family, and their passion for cooking -- each accompanied by one or more of their personal signature dishes and family favorites. From well-known chefs and TV personalities like Buddy Valastro, Carla Hall and Georgetown Cupcake to culinary revolutionaries such as David Chang, Michael Voltaggio, and Dan Barber, 100 of America's top food personalities share their most treasured home recipes in America The Great Cookbook. Lavishly photographed with spectacular images of food and locations from across the United States, this gorgeous cookbook highlights what is the very best about America and its rich culinary traditions. 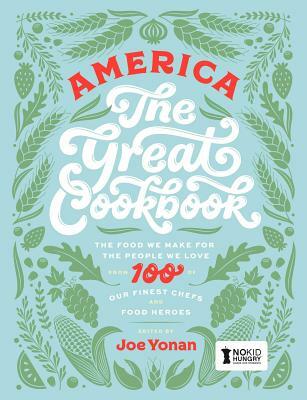 With a unique cover designed by renowned artist and letterer Jessica Hische, America The Great Cookbook is a beautiful book you can explore, share, and cook from for years to come for those that you love. America The Great Cookbook fights childhood hunger by helping No Kid Hungry connect kids with at least 200,000 meals. Recipes include Michael Hudman & Andy Ticer's Cinnamon Rolls with Maple Sugar and Buttermilk Frosting, Simone Cormier's Country Pork P t with Cherries and Hazelnuts, Joan Nathan's Matzo Balls, Hugo Ortega's Barbacoa de Zaachila, Charles Phan's Black Bean-Glazed Pork Spareribs, Marcus Samuelsson's Fried Chicken and Red Velvet Waffles, Nancy Silverton's Chicken Salad with Indian Spices & Preserved Lemon, Melissa Clark's Cod with Roasted Asparagus and Green Onions, Michael Voltaggio's Loup de Mer, Virginia Willis' Summer Squash Salad, Carla Hall's Collards 'n' Potlikker, David Chang's Clam Juk, Ronni Lundy's Mama's Speckled Butter Beans, Thomas McNaughton's Ricotta Triangoli, Amanda Saab's Baklava Cheesecake, Georgetown Cupcake's Red Velvet Cupcakes, Michael Solomonov's Homemade Laffa Bread, Franklin Barbecue's Espresso Barbecue Sauce, Mindy Segal's Matcha and Mint Hot Chocolate, Leah Chase's Creole Gumbo, Marcella Valladolid's White Bean and Grilled Octopus Salad, Ruth Reichl's Pink Deviled Eggs, Molly Yeh's Vanilla Cake with Rhubarb Buttercream, Dan Barber's Juice Pulp Cheeseburgers, Kris Yenbamroong's Uni Garlic Fried Rice, Rick Bayless' Enchiladas Verdes, Ana Sortun's Asparagus Fatteh, Francis Lam's Chinese Stir-Fried Tomatoes and Eggs, Erin French's Blueberry Spoon Cake, Joanne Chang's Raspberry Swirl Meringues, Nathalie Dupree's Grits with Greens and Shrimp, Ed Lee's Braised Turmeric Chicken, Pableaux Johnson's Monday Night Red Beans and Rice, Andrew Zimmern's Cold Spicy Peanut Sesame Noodles.